University of Arizona scientist Pedro Andrade-Sanchez explains concepts of field phenotyping to workshop participants at the UA Maricopa Agricultural Center. The vehicle carries multiple sets of sensors to measure crop height, temperature and canopy color and uses GPS to allow measurements to be associated with specific locations in the experiment. Kansas State University, University of Arizona and USDA-ARS collaborate to train scientists and students in field phenomics. MARICOPA, Ariz. – High-throughput phenotyping, a new area of agricultural research, is key to accelerating progress in crop improvement. To ensure continuing advances, there is a critical need to train graduate students and scientists in this emerging technology. “The past decade has brought phenomenal progress in crop genomics enabled by developments in high-throughput DNA sequencing. This automated lab technology has made understanding the genetics of crop plants very tractable,” said Jesse Poland, assistant professor in plant pathology at Kansas State University. Unfortunately, similar advancements in automating field measurements of crop traits such as height, disease resistance or grain yield are only beginning to appear. Fifty-five graduate students, researchers and industry representatives from around the world are participating in a second workshop on field-based phenotyping at the University of Arizona (UA) Maricopa Agricultural Center (MAC) in Maricopa, Arizona March 16-19, 2015. Funded by the National Science Foundation, the four-day workshop is organized by researchers from K-State, the University of Arizona (UA) and the USDA-ARS). 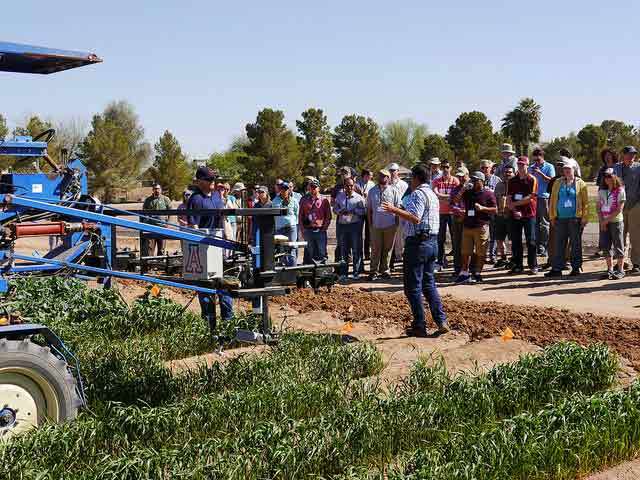 Clear skies in southern Arizona, combined with soil and weather conditions that provide long crop growing seasons, make the region ideal for developing and applying techniques for field phenomics. “Phenotypic measurements are still largely collected by hand. If we want to measure plant height, we get a yardstick and head to the field. The trouble with this approach is that evaluating plants in the field becomes very time consuming and labor intensive,” said Poland, who is principal investigator on the NSF project. “This limits the size of populations we can evaluate for genetic studies, as well as the number of new candidate varieties we can test in breeding programs. Overall, we need automated, high-throughput remote sensing technologies that can be applied for field research,” he said. This is an area where the contributions of agricultural engineers are key in advancing field-based high-throughput phenotyping. “We work in different fronts: from adapting power units to making sensor deployment in the field more efficient, to integrating sensor technology like GPS positioning and crop canopy spectral/thermal sensing. There are many technical challenges to solve, but this is rewarding work,” said Pedro Andrade-Sanchez, a precision agriculture specialist at the University of Arizona and a collaborator on the project. Eleven instructors from K-State, UA, USDA-ARS, and the iPlant Collaborative will lead lectures and field-based exercises at MAC, a UA College of Agriculture and Life Sciences-affiliated agricultural experiment station located about 30 miles south of Phoenix. Topics covered in the workshop include electronic field instrumentation, vehicle configurations, georeferencing, image analysis, and data management. The first three and a half days include lectures, field exercises, and data processing, taking advantage of winter-sown experiments at Maricopa. On the last afternoon, participants will have an “open-lab” session where they can pursue specific interests or concerns with instructors. Training materials will be publicly available through the project website. A third annual phenotyping workshop will be offered at MAC in 2016. For more information on field phenomics and future workshops, visit Field Phenomics.